Am I living under a rock? I must be if this is the first time I've come across this recipe! 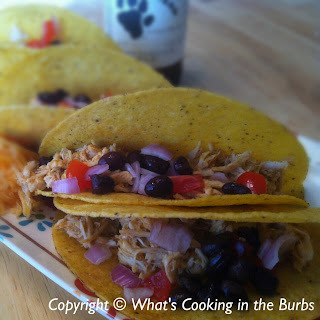 Cheddar, Beer, Chicken, and Tacos? Yes, Please! All of my favorites combined together to form the most delicious taco I have ever had in my life. Yes, you heard that right. They were incredible! In a bowl, mix together chili powder, cumin, garlic, onion, paprika, cayenne, salt and pepper. Measure out 3/4 cup of your favorite beer, and whisk the seasonings into the beer. Add in your liquid smoke. Place chicken in the crock pot and pour in beer with seasoning. Cook on low for 5-6 hours or high for 3-4 hours. Remove the lid, and shred chicken using two forks or kitchen tongs then let sit in the crock pot for another 15 minutes or so. Turn the crock pot off, and right before serving toss in cheddar cheese. Once combined, transfer the chicken to a large bowl and assemble your tacos. Enjoy! Oh Wow! I'll be making these for sure. Thanks for sharing! I love all your taco recipes. I'm making this soon! We haven't had tacos in a while - think I'll try your recipe, it certainly is different :-) Thank you for sharing at our ALL MY BLOGGY FRIENDS ! Hi and thanks for sharing this recipe. I love any recipe that you can make in the crock pot! I saw it on get him fed fri.
Is the beer necessary for the way it cooks or is it part of the taste. Could I substitute something else? You definitely need the beer. (non-alcoholic would work too) It helps keep the chicken moist. If you don't care for beer you could substitute chicken stock but it would change the taste entirely.